Aspiration. Developing new commercially valuable lily cultivars that will be introduced in the market on a large scale. Preferably a series of all types in all colors. A big challenge because there is already a lot of choice and the quality requirements are becoming stricter. Being innovative is therefore very important. Nevertheless, we still see new opportunities to make our lilies even more attractive to our customers. Perfection. Naturally, the cultivars should meet all the quality requirements of our customers. A perfect lily should not only possess ornamental value with a sufficient bud number and intense colors. They also need to have good growth vigor and tolerance to stress and diseases. Therefore, a good bulb quality is essential. Moreover, the cultivars must be strong, have a good vase life and transportable. There are many more desirable properties that need to be brought together in one perfect lily. Teamwork. Fortunately, I work together on this in a team of highly motivated colleagues with great expertise. Van Zanten Flowerbulbs very well knows its customers and the product requirements that should be met. Our breeding programs are designed in such a way that we can respond to the these requirements. Together with my colleague Elleke Boogert, we share part of the breeding program, each of us focusing on specific product groups. Elleke has a lot of experience in breeding Orientals, Trumpets, OT and AT hybrids whereas I mainly breed for the LA- and LO-market and some other specialties. Research. Before I joined Van Zanten Flowerbulbs in 2015, I worked as a lisianthus breeder at another company. After having worked there for some years, I wanted more depth and challenge in my profession. Fortunately, I found this here at this modern and innovative company. In addition to our regular breeding activities, we also do a lot of research in collaboration with the research department in Rijsenhout. The research results provides us useful information which is needed to keep our breeding programs at a high level. Results. The plantings of the new selections in the greenhouses at Van Zanten Flowerbulbs in Hillegom are already behind us. They are now fully growing. Recently, we also finished planting the latest seedlings on the field in the Wouwse Plantage. For me a very special event and also quite exciting because these are the results of my first crossings. 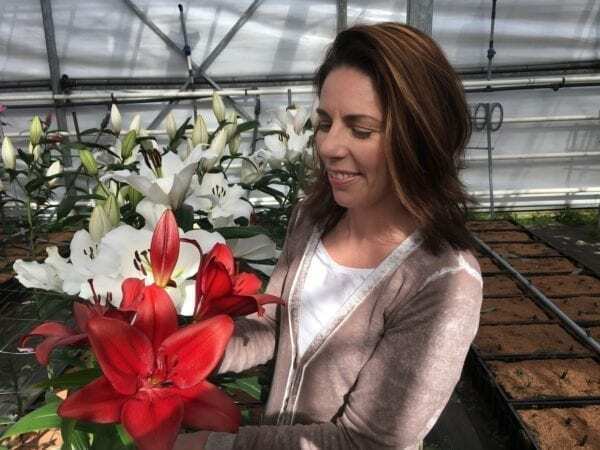 Even more because during my first crossing season I was inspired by a very experienced and skilled colleague who taught me the passion and love for lily breeding. I look forward to selecting new lines this summer in a field full of blooming lilies. But first we are fully preparing us for the new crossing season. In this way we do everything possible in order to deliver high-quality products. Let’s Celebrate! Fireworks ™ receives wildcard for the Dutch Tulip Award.